This is a bit of a stretch, but they obviously think that a market can be made for it. I fail to understand just how the high energy input can be properly offset by the value of produced produce unless the owner is the end consumer. More usefully, I would like to see the system used to naturally clean and humidify the air system of the building itself and the produced heat also integrated. It still will test economic sense. The real cultural problem is that we make buildings as passive as possible. Just how does one integrate a skilled labor based service into all this? Just building southern exposed atriums on a building gives one pause as it is presently a luxury. Yet it could provide high quality air on a year round basis and stabilize the building climate. It does mean integrating additional staff and expecting much more. Serious food production could offset that inherent cost base and plausibly defray general staff costs. This may have merit, but will never happen unless the city mandates the protocol. 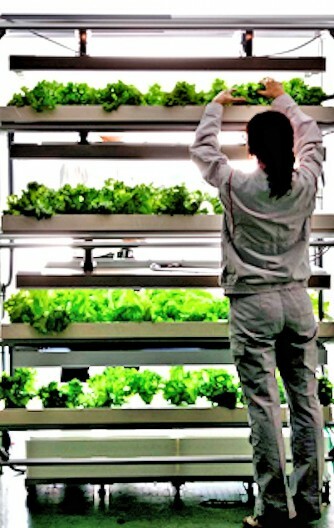 Daiwa House, Japan's largest homebuilder, has introduced a line of prefabricated hydroponic vegetable factories, aimed at housing complexes, hotels, and top-end restaurants. Called the Agri-Cube, these units are touted by Daiwa as the first step in the industrialization of agriculture, to be located in and amongst the places where people live, work, and play. More and more people desire sustainable, organic produce for their own use, and are turning to urban farming in an effort to insure the highest degree of freshness. However, some municipalities, neighborhoods, and homeowners associations have rules that effectively block such endeavors in areas under their sway. Add drought and pest control to the picture, and suddenly urban farming may seem more trouble than it is worth. There is a growing need for local supplies of freshly grown produce that avoids the difficulties presented by conventional small farms and gardens. This is where the Agri-Cube comes in. Measuring less than five meters (about 16 feet) in length and 2.5 meters (about 8 feet) wide, Daiwa's Agri-Cubes are smaller than a twenty-foot equivalent shipping container. An Agri-Cube can be brought to an installation site on the bed of a light heavy-duty truck. A concrete foundation about 10 square meters (108 square feet) in size must be prepared before delivery, along with plumbing and electrical utility hookups. 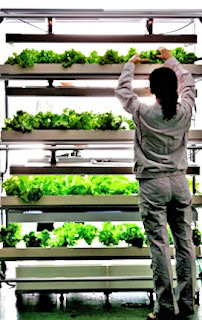 Daiwa claims each Agri-Unit can grow about ten thousand servings of fruits and vegetables each year at an operations cost of about US$4,500, which corresponds to only 45 US cents per head of lettuce. An Agri-Cube is designed to require little maintenance or attention to the hydroponic and lighting systems. It is delivered ready to use, with all the hydroponic equipment, air conditioning to maintain ideal growing temperatures, a heat-exchanging ventilation system, and special growth lights to encourage faster plant growth installed and functioning. The basic structure is a steel frame building, with anti-rust treatment and floor, wall, and ceiling insulation. Solar panels and air curtains (to better maintain the controlled environment) are available as options. Initially, Agri-Cubes will be marketed to the food service industry. Daiwa intends to extend that focused niche market to include apartment houses and other housing complexes, neighborhood co-ops of perhaps ten households, small-scale stores, and local organic food suppliers. A video from DigInfo TV appears below that will give a clear overview of the makeup of an Agri-Cube. Beginning at a price of $70,000, the Agri-Cube may soon be dispensing fresh fruit and vegetables in your neighborhood.